If you haven’t made a Star Wars fan film, especially with Rogue One: A Star Wars Story about to drop, well, then “I find your lack of faith disturbing.” OK I’m kidding, but when you’re just starting out, there’s no better way to cut your teeth than to play in the Lucasian sand box. In what’s rapidly becoming an annual event, the company behind HitFilm Express makes a yearly Star Wars film. 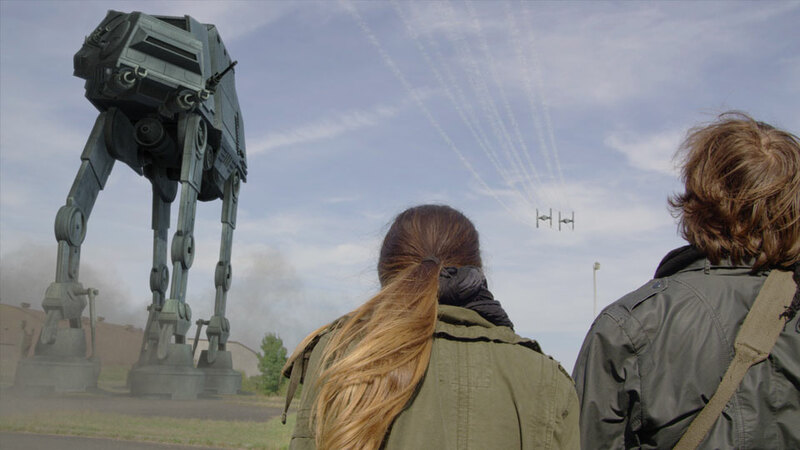 HitFilm Pro is an editing and visual effects utility, and it makes it easier to create a Star Wars-style film and go up against the Empire. And their own fan film Rebellion shows you what’s possible. In addition to the dramatic reveal of the ATAT at the ending, there was also the cloning of hundreds of stormtroopers, the targeting computer overlays, and the holographic layout of the facility’s layout. But there was also all the laser blasts from the gun battle. That would normally require a lot of tedious rotoscoping (that’s how we did it back in the old days). But now, the software has automated a lot of that tedious rotoscoping to make it easier and faster to do. Add some colored lights, some set pieces to sell the location, and some smoke effects, and you’re set. The first effect you’ll see is the creating of hundreds of stormtroopers, which was using masking and layering to take a limited amount of actors in costumes and then duplicating them. And HitFilm even gives you the elements to do it here. It’s important is to shoot the scene several times with your actors, moving them to different parts of the scene with each take. The key here is to have your camera locked down. Then layer all the takes together, masking out what you don’t want in each layer. The result is cloning the troopers to make them look like you have dozens, or even hundreds of troopers! Hit Film is also going to release 3D Stormtrooper models after the first of the year to makes creating an army of troopers even easier. Next came the targeting computer in the ATAT which will be from the point of view of the ATAT itself. Easily done by shooting a drone shot overlooking the actors as they burst out of the bunker, surprised by the Empire’s deadly assault vehicle. Using the compositing feature in HitFilm, the actors were first selected for tracking, so that they will be tracked while the composite is overlaid. “Once the tracking is done,” says Axel Wilkinson of HitFilm, “HitFilm knows exactly where the center is located in each frame of our video.” HitFilm can then use a point layer to marry that tracking information to the composite you’re about to make in the next layer. Then you can build the display interface of the ATAT targeting computer. This is where you can play with it. HitFilm provides the elements here, and you can then lay out the grid and adjust it to your liking, including adding some distortion, contrast and hue to your graphics to sell that shot. The tutorials above will show you how the tools are used to give you an idea of how to do it. Again, at the beginning of the new year, HitFilm will provide a 3D model of the ATAT, plus some flying TIE fighters to beef up your Imperial presence. “You can bring a sense of scale and peril to your film by importing and animating complex 3D models,” the HitFilm site says. Finally, there’s the gunfight. You can’t have a Star Wars gun battle without laser blaster bolts flying all over the place, and lets face it, Storm Troopers aren’t known for their aim. HitFilm shows you how to drag and drop muzzle flash and blaster bolt effects to create a gun battle that looks like it was made by a pro. Plus, you also need blaster impacts and flying sparks and smoke to sell the impact. “The key to getting good results for a scene like this, is combining multiple techniques,” Axel says. HitFilm, of course, gives you all the assets to work with it. Keyframing is going to be how you create the illusion of the flash coming out of the gun and sending the bolt on it’s way. The next effect is to create a light that will reflect onto your subject as the gun fires. This requires masking your subject, and then adjusting the lighting hue on the subject to create a kind of flash lighting onto your subject. Key frames will tell HitFilm when to light the subject during the blaster fire, and then when it goes back to normal. All that’s left if for your actor’s performance to sell the effect of shooting the blaster. Then there comes the blaster impact; this adds a feel of chaos to the scene as blaster bolts have to hit something (and we all know that Storm Troopers will hit anything but what they want to hit!). The impact project files are available from HitFilm and it includes stock footage of sparks, smoke, and the bolt impact. All that’s left is to use masking and keyframing to create the light flare of the blaster impact to sell it as being a real blaster impact. Lastly, here’s a quick overview of the behind-the-scenes of the making of Rebellion that ties all the elements together. With the support they provide in tutorials and project files, HitFilm Express is a great entry level point into making the kinds of visual effects that you, as a filmmaker, see in your vision. And when you’re ready to graduate, HitFilm Pro can take you to the next step.